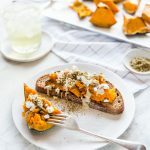 Another one to work through the archives, I give you photos and a recipe from February, with a slightly inter-connected stream of consciousness set of run on sentences from today. Shocker. I could eat dumplings every day. Really. These however are not dumplings, obviously — but they are something you can get at dumpling stands and therefore make me think of dumplings. These little beauties, in case the title didn’t tip you off, are steamed buns. 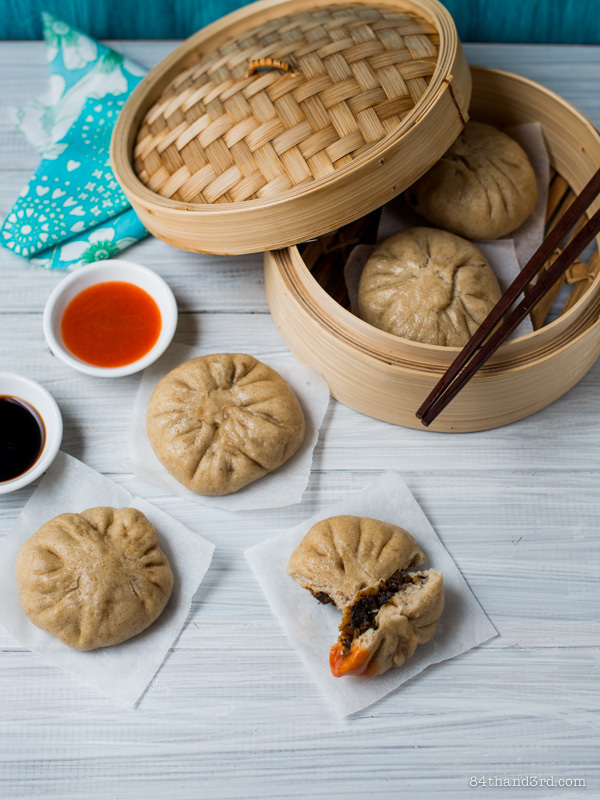 Do you have any idea how good steamed buns are? Soft and fluffy with a slightly shiny exterior and a delicious surprise inside. Traditional bao, while gorgeous, are full of white flour and sugar — so I made my own (and then again, and again) and boy am I glad I did. I’ve yet to make a proper loaf of bread with Ray. I do however keep coming up with recipes to use up starter as I hate to throw things out and therefore when I feed him — weekly? fortnightly? good thing he isn’t a goldfish — I end up with a growing quantity of fragrant starter and no go-to bread recipe with which to use it. 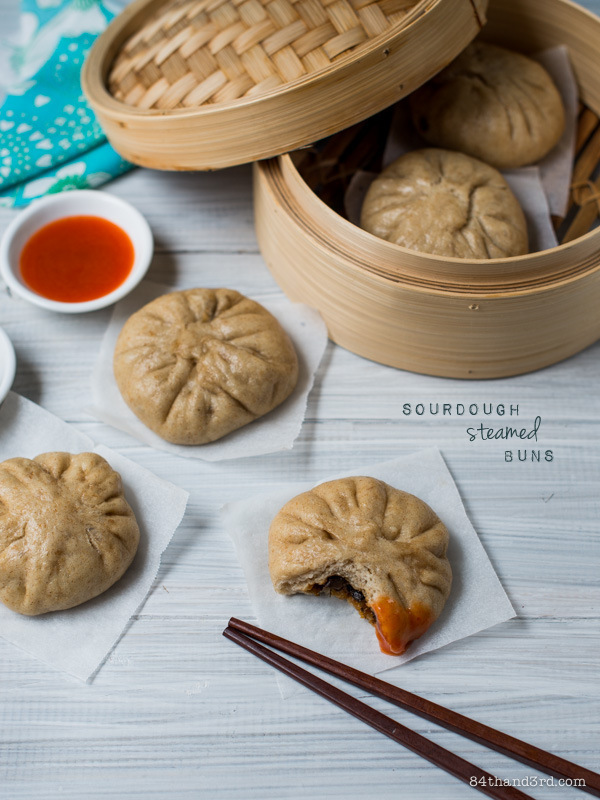 The buns for these photos were filled with an Asian-inspired BBQ Mushroom filling which I need to make again in order to develop a recipe with an actual list of ingredients instead of a bit of this and a bit of that floating in my head. They’ve also made an appearance stuffed with leftover roast lamb, shredded chicken, and a brilliant if I do say so myself combo of dark chocolate and raspberry. Each time I made them I refined the recipe a bit. They got fluffier and puffier and more perfect and I should have re-shot them but instead we simply ate them. It happens. 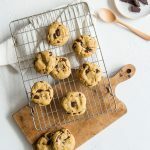 Fill them with whatever you wish, or as I did today — instead of rolling and filling — simply drop balls of dough into a paper lined muffin tin, set in a roasting pan with boiling water, cover with foil, bake, split and smear with fresh butter or use as slider buns. Needless to say, either way I’m in love. 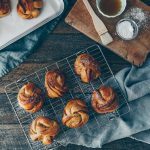 Steaming keeps these buns light and fluffy while the sourdough starter and spelt flour make them far more nutritious than the originals. The best part is that you can fill them with pretty much anything. Everybody wins. In a medium bowl roughly squidge together starter and spelt flour — cover with a tea towel and rest 10 mins. Stir in 1 c white flour, water, oil and salt — cover and rest 10 mins. Dust benchtop with a generous amount of remaining white flour and scrape out dough. Use scraper to fold edges of dough up and into centre like an envelope, then flip over. Cover with upturned bowl and rest 10 mins. Knead dough 2 mins, using remaining flour as necessary to create a soft but still sticky dough. Cover with bowl and rest 2 mins. Repeat knead 2 mins, rest 2 mins cycle two more times. Drizzle a bit of oil into the bowl, turn dough to coat, seal bowl with plastic, cover with a tea towel and leave to rise until doubled. Timing on this depends on your starter and kitchen temp. Cut baking paper into 4 x 4 inch squares – you’ll need 16 pieces. Deflate dough and scrape onto lightly floured benchtop. Use the heel of your hand to flatten out slightly then sift over baking powder. Roll up then knead until powder is well incorporated. Divide into 16 pieces. Working with one piece at a time, roll out into a 3 ½ – 4 inch circle (9 – 10 cm), leaving the centre slightly thicker than the edges — dust bench with a bit more flour if necessary to keep dough from sticking. Spoon approx 2 tsp filling into the middle, then gather edges, pinching as you go, to create a sealed bun. Place on a square of baking paper then repeat with the remaining dough. 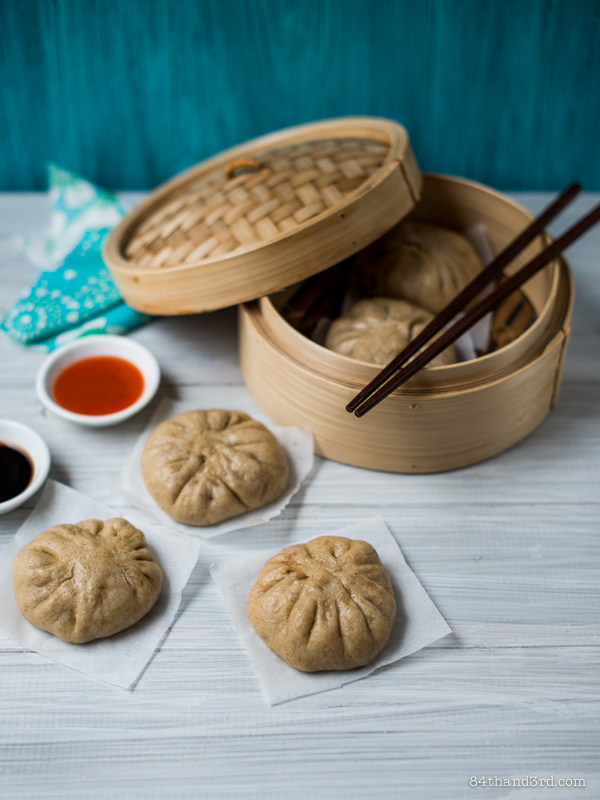 Let buns rest 20 mins as you set up your steamer and bring it to a boil — I use a saucepan under a lidded bamboo steamer basket . 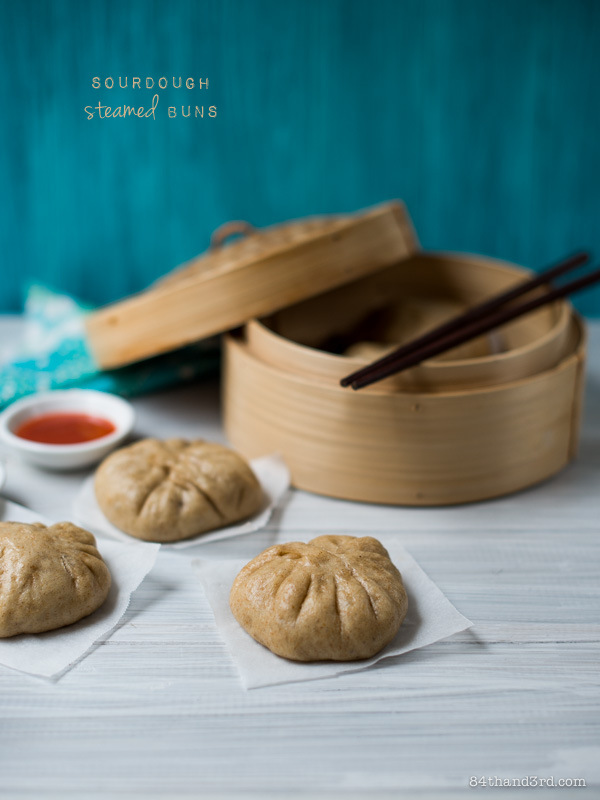 Place as many buns, still on their squares of paper, as will fit comfortably in your steamer. Make sure they do not touch, they will expand as they steam. Cover and steam 15 mins, topping up water if necessary, then remove steamer from water and allow to sit 5 mins still covered. Repeat with remaining buns. Serve hot with soy sauce or tamari and sriracha chili sauce. Starter: my starter is half rye half white and the consistency of thick pancake batter. Steaming: quite obviously a large basket or a few small ones stacked on top of each other will make the steaming process quite a bit quicker, mine can only hold three. It takes ages. Note to self, get another/larger basket. I’ve been playing with steamed buns too this week 🙂 I got completely hooked at a cooking class last weekend and there have been a few in this house since. I am loving spelt in mine too. I have made them previously with sourdough but found them quite heavy, so I do like your idea of lightening them with the baking powder. And as to just steaming the buns without filling, genius! These buns look lovely JJ! 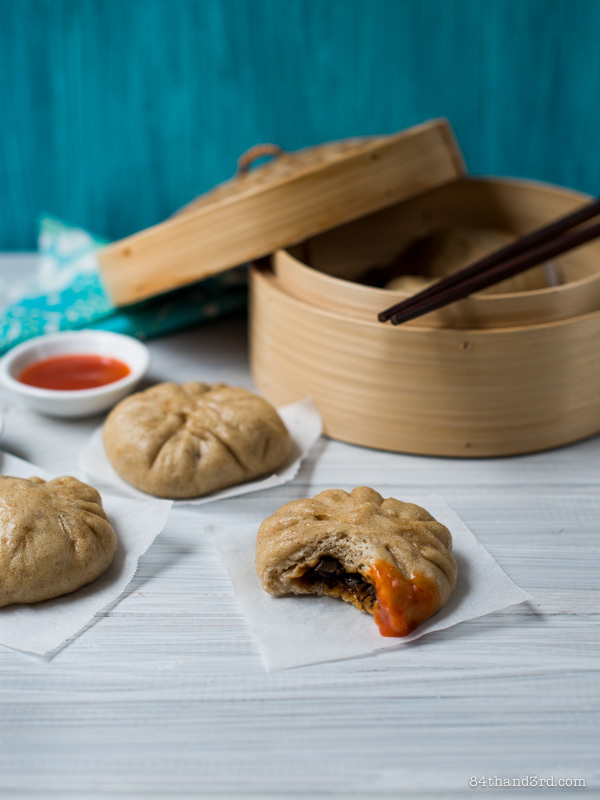 What a great way to enjoy steamed bun goodness without all of that sugary white flour dough! I love the idea of steaming the buns in the oven too, then eating them hot with butter. Oh man. Yum! I have been trying for a very long time to master Sourdough and have been unsuccessful. 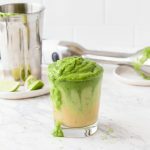 I really want to try again especially seeing such a innovative recipe on your blog. Love it. Wah!! Sourdough steamed buns?? Such a clever idea! Your steamed buns look great. When I do a recipe couple of times I tend to forget to snap shots too and go straight to the eating step! I too have been experimenting with steamed buns and finally felt like I mastered the buns using organic AP flour. THEN I started thinking about using einkorn flour, but I was thinking before venturing into that, I should learn to use sourdough, since it is much healthier! I will get some spelt and try it out!!! So glad I stumbled onto your blog.